AADHAAR is the world’s largest biometric program according to UIDAI’s official website, so it also keeps large volumes of personal information of people in India. Lots of questions also came in limelight regarding the security of this huge collection of information. What is Aadhaar Virtual ID (VID)? To make this 16 digit number more secure, UIDAI launched Aadhaar Virtual ID (VID). Now we can simply use this VID to authenticate transactions and KYC services instead of giving Aadhaar Number. – VID is a temporary 16-digit number like Aadhaar Number. – It can be generated at the official website of UIDAI. – Remains Valid for minimum One day. – Mobile number must be linked to Aadhaar to Generate and use VID. – Can be Re-generated any number of times. – VID can be used instead of 16 Digit Aadhaar Number. How to Generate Aadhaar Virtual ID (VID)? Just follow these simple steps to generate you Aadhaar linked VID number. 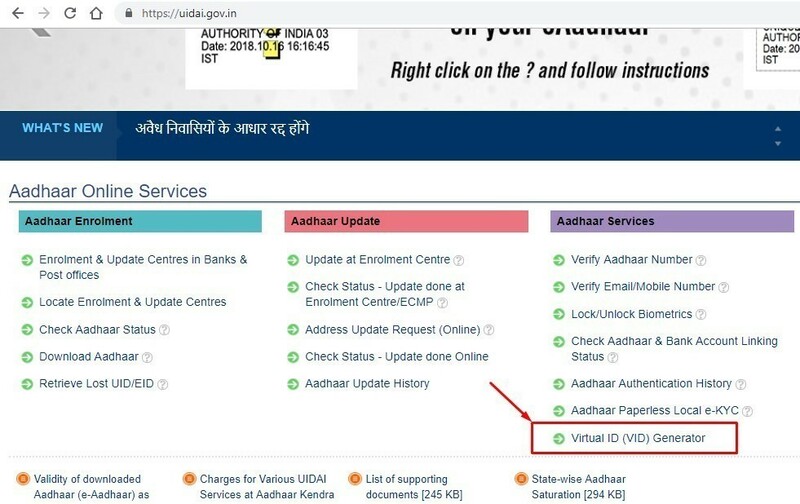 Step 1 – Visit UIDAI’s official website and click on “Virtual ID (VID) Generator” link. Step 2 – After that, it will open a page with a form asking your Aadhaar Number, after that Enter OTP received on your registered mobile. Then Enter OTP and check “Generate VID” if you want to generate new VID or “Retrieve VID” if you want to see your generated VID. Step 3 – Now it will show a success message and New VID will be sent on your Aadhaar linked registered Mobile number Via SMS. You can now simply use this VID instead of Aadhar Number. Next Next post: How to Change/ Update Address in Aadhaar Card Without Address Proof?